Mama Mia! Click here to play! It's another busy Friday night at Crazy Pizza and the cooks need your help keeping up with demand. If you can help them put together some fantastic pies, you'll be handsomely rewarded for your work! Doling out the pizza slices is what you'll want to do, so you'll need to spin as many slices as you can. This tasty symbol will bring in the highest payout if you can spin three of them across the single pay line; 6000 credits in fact. The customers will also want a soda to go with their slice. Spin three soft drinks across the pay line and you'll get 600 credits. Don't forget the cheese! It's not a good pizza without plenty of cheese. There are triple, double and single cheese BARS in this pizza shop that will bring in 150, 75 or 30 credits respectively if you can spin three of each across the pay line. Last but not least is the sauce. Spin three sauce splatters across the reels and get up to 15 credits. Can you help the cooks fix up enough pies to keep the Friday night crowd happy? Give it a go in Crazy Pizza! The pizza slice acts as a wild and will replace all other symbols to help you spin in more winning combinations. The Top Game software allows you to use an auto spin option. 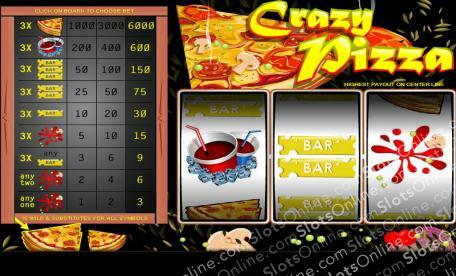 Simply place a bet and hit auto spin and the reels will start spinning. The game will stop for a couple of seconds between each spin so that you can view your wins. You can adjust it to stop spinning after a desired number of spins. Iif you trigger a feature it will stop to let you know that you've won free spins, etc. You cannot view the paytable while the autospin is going.